Chau does a beautiful job of telling the story of how, through education, a passion for food can become a career-worthy craft. Education has been part of our mission at GFJ since we began in 2010. What does education have to do with a job search engine? We know that it's an essential element of the support system for those who are working in food, as well as enjoying it, sharing it with others, and creating and strengthening a thriving local food system. 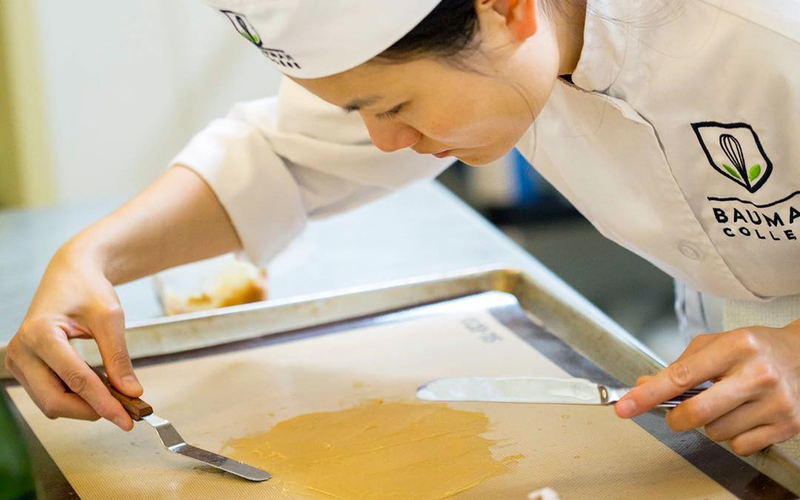 You can learn a lot more about Bauman College's Holistic Nutrition and Culinary Arts program on our Education page at goodfoodjobs.com/education. I knew I wanted my work to involve food when I found myself happiest cooking in the kitchen, thinking about food places to explore wherever I travel, and feeling myself light up when I spoke of food with passion and fervor. All of my interests had food as the common thread, and since a lot of my time is devoted to work, I wanted that work to be meaningful, fun, and inspiring. Before my culinary training at Bauman College, I was a self-taught cook for years. When I decided that I was going to make food my work and not just my hobby, I knew I had to take what I had learned to the next level. I see food as a major change agent in how we nourish our health and heal our planet, without having to sacrifice the pleasure food brings us, and Bauman shares that viewpoint. My time as a student has allowed me to get curious and experiment with different ideas that come to mind when I'm in the kitchen. I have a background in science and arts, so I'm able to draw from those two fields when I'm cooking. The science part allows me to understand how foods interact with each other to yield delicious results. My arts background ignites my creativity when I'm developing recipes and experimenting with plating aesthetics. Coming to accept uncertainty. Making peace with this acceptance gave me permission to take risks. I keep these words from Mary Oliver close to me: What is it you plan to do with your one wild and precious life? I'm always reminded to do only what brings me joy and meaning when I think of them and that keeps me going. Prior to Bauman, I worked for an organization with a mission of getting youth outdoors. Their workplace culture left an indelible impression on me that I've continued to cherish. It was a place where everyone's contributions mattered, and were always acknowledged. They gave me the space to express my strengths and thus I was inspired to bring forth my best every day. This leadership model was invaluable as it showed me what respect and trust for your colleagues can inspire. This is one I'm trying to figure out myself as I'm navigating through school. What I do know is that there are many possibilities in food right now, existing in exciting platforms. I think people care now more than ever about where our food comes from and the impact our food choices can have on our health and our planet. For people in the food field like me, this means creating educational opportunities where people can be given the tools they need to be the solution. There are many ways to reach people, and I think the simplest is to start with a delightful meal cooked with care. I will happily take organic/biodynamic farm fresh produce or craft chocolate in exchange!